“Notice” word itself bring a lot of panic among the taxpayer. Income Tax Notice is not always brought you into trouble but also keep you away from it. However, Some Income Tax Notice is harmful and some are harmless. 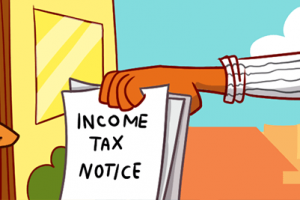 In this article, you will surely understand the kind of Income Tax Notice, intimation u/s, the reason behind the Notice and how to get rid of it. If you look closely while filling IT return there is an option of selecting the form u/s different segments for different reasons. After filling your Income Tax Return in Form of ITR I, II, III, IV, V, the Income Tax Department go through every return with the help of the automated system and match the data available with them. If they get some things which they required to clear, they issue an Income Tax Notice accordingly, but there is nothing to worry about, you have to read the notice carefully and resubmit and reply the notice. Some of the TaxPayers usually said this Intimation Notice u/s 143(1) an assessment order. Secondly in the cumutation section you can see the excess Tax paid by you, which is formally refunded to your account. last, If you have paid the Taxes which is as per income Tax account officer and computation section is short, as per intimation u/s 143(1), you have 30 days to pay the dues. If everything is matching, so take a Print out and keep your Income Tax File for further correspondence, as per commutation report if the Tax paid is higher, the Departement will refund the amount in the account details provided. If the Taxpayer paid tax is short, that would be treated Income Tax Notice of demand u/s 156. Under this section, if the Taxpayer partially demanded to pay the unpaid tax, the Notice of demand u/s 156 will be issued to you, the taxpayer needs to fulfill the demand within 30 days of receiving of this Notice. Mismatch in Form 16, Form 16A or Form 26AS while filling of Income Tax return bring you near the Income Tax Notice u/s 143(1)(a). After getting the notice you have 15 days to revise your return as per Form 26AS. The difference occurs due to mismatch of gross salary, Tax deduction at source, In the time limit if the Tax Payer unable to revise the return, the AO raise the income tax demand under section 143(1). Also, Read: What is Form 15G Form 15H? Receiving Notice u/s 143(2) is chance you have been selected by the Assessee Officer (AO) for detailed Scrutiny, it doesn’t mean that there is something wrong, but the AO feels that there are some documents missing. The Assessee Officer (AO) might ask you to furnish all documents related to exemption, Source of Income, deductions if any, Form 80G, if mentioned and Loss you have made. It might be possible that you will get the notice after the Assessement year also. If you have not furnished your Income Tax Return, you are free from scrutiny under section 143 (2), but you might invite Assessee Officer u/s 144. Under Section 143 (2), the Assessee Officer possess the Power to Scrutiny the documents submitted by the assessees, It is however seen that the assessees represent by their Advocates, Tax Consultant, Chartered Accountant. If the Assessee Officer fells at a certain level, assessees himself required answering some of the questions, then u/s 131 the power is invoked by issuing the Summon. After issuing the summon the assessees is empowered to present in front of the assessee officer, and produce all the documents and Books. The Penalty of ₹ 10,000 is levied on Non-compliance of the summon. Section 139 of the Income Tax Act deals with the Late filling of Income Tax Return, which reminds you to fill the Income Tax on the prescribed date for individual and companies. Although Section 139 deals with the Late filling of Returns, there are several subsections, which was issued if the return is not filled with different segments. Section 139(3) stats, if the assessee that earn any Profit that falls under capital gain, required to fill the return before the expiry of the due date, to avail the benefit of carrying forward the Losses. If the Tax payee is unable to fill the return to a time frame or before the expiry of the due date, he will not avail the benefit of the section. If the assessee is unable to fill the return in the time frame prior to the expiry of the due date of filing Income Tax return u/s 139(1), the assessee still fills late return u/s 139(4) as the belated return within the period of one year. The Penalty of ₹ 5,000 u/s 271F of the Income Tax act on the assessee for late efiling income tax Return, if the income exceeds the maximum amount limit prescribed the Income Tax Departement India. 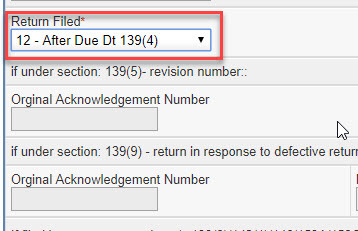 If the assessee filling returns u/s 139(4), don’t forget to select the return filed to “12 – After Due Dt 139(4). under Section 139(5), the assessee is entitled to fill the revised return within a period of one year after income tax filing of return u/s 139(1), The Late income Tax return filled cannot be revised. The opinion of the revised return is provided due to submission of original return contain some wrong entities or values. You must also aware of selecting Revised Return u/s 139(5). it is mandatory to fill the Orginal Acknowledgment number and Date of Filling of Original Return for cross verification and overlapping by AO. If the Tax assessment by the assessee by wrong and tax paid of partial. If the Assessee Officer found some discrepancies in the return, you will have to shake hands with the Notice u/s 139(9) of the Income Tax Act. 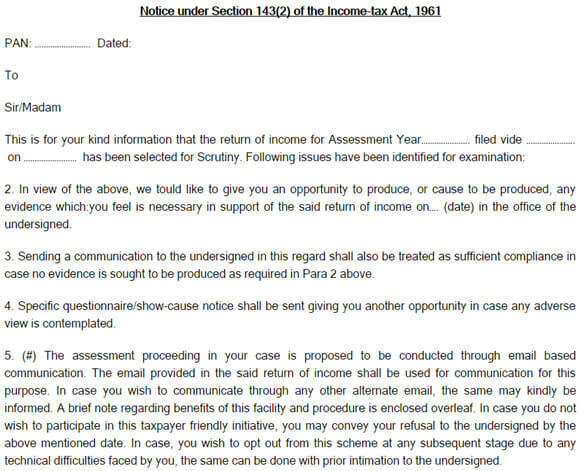 Income Tax Departement also provides the option to reply and revised the return u/s 139(9). You can directly respond by click on to the above option. You can click on the response on the right side button. In easy language, the Assessing Officier under the following condition makes the assessment of the taxpayer. If the taxpayer fails to file income tax return u/s 139 (1) or belated return u/s 139 (4) or revised return u/s 139 (5). If the taxpayer unable to comply with the required under section 142 (1). Again If the taxpayer unable to comply with the required under section 142 (2). If the Income is more then 1 Lakhs the notice will be sent within 6 years. Notice or intimation u/s 154 is nothing but the order issued by the Income Tax Departement after filling revised return u/s 139(5) by you or if the assessment intimation order u/s 143(1) issued by AO found some discrepancies, they rectify by issuing order u/s 154. It must be treated as correction of a mistake and must be kept in the fill the Income Tax Return for your record. Inheritance is the property gifted to the son or family member after the death of owner, Inheritance Tax is not levied in India, but if the income comes through that property that would be added in the new owner income and will be taxable. In this Post, I tried to explain several types of Income Tax Notice or obtain notice of assessment by you, in different segments, in many cases, we use to mass up the situation just without grabbing information and reply to the Notice without taking support from any export. This Article will help the Taxpayer in any kind of Notice if rings your doorbell. I also recommend reading below link for proper Guideline. Demonetisation drive the Economy towards the path on which everybody includes an Employee comes under the radar of Income Tax Departement. As per recent discloser of Economic Times “Out of 125 Crore people only 1.5% people i.e. 1.9 Crore people pay Taxes“. In the current scenario Income Tax department keep an eye on small issues which includes Income Tax Notice for Employee also. It is very scary when we receive Income Tax Notice, don’t scared there are several parameters under which you must get the Income Tax Notice. These Parameters not only work for Employee but also for the individual, HUF etc. If you are in the possession of PAN number, it is mandatory for you to file Income Tax return even though you come under Basic exemption limit i.e. Rs 2,50,000/-, but nowadays people use their PAN number for Identification Proof. You are also getting your income after deduction of TDS If you have not filled the Income Tax Return, don’t waste time because you are expecting the notice from Income Tax Departement very soon. Drop in Income from Salary declared in Income Tax return raised a question mark on the loyalty of your return, although dropping of income from salary is not an unexpected issue, it might open gates of the department for you. It is more often happens with Bussiness or trading because their income is volatile, but for salaried it is unexpected. Paying Taxes in advance is a good indication for the Income Tax department of your loyalty and also impact the credit rating on your finances. Sometimes you pay advance taxes as per your calculation to the department and after filling final return you ask for the high refund, this will raise a question mark. It might be, Income Tax Departement scrutinies your return because of mismatch in your planning. You can avoid this just be go slow and plan properly. Refund of 10 % to 15 % is accepted and must be refunded. Asking for refund higher amount without solid reason invite the Income Tax department on your Doorsteps. Almost every Employer nowadays deduct TDS before credited salary into account of employee and provide FORM 16 to the employee. The same processor is followed by Bank, they also deduct TDS on the interest paid to you against Fixed Deposit, the bank also provide you the TDS certificate in FORM 16. You can recheck all your deduction from FORM 26AS before filing your return, sometimes your employer deducts TDS from your salary but not deposited in your PAN number, that would not be considered from your side, you must reconcile from FORM 26AS. It is very important that you must declare all your sources of Income while filing Income Tax Return, Declaration of income from Salary is not enough if you have any other sources like a capital gain, income from house, Income from agriculture. There is some income which is also exempted from Income Tax Like, Long-term Capital Gain from Shares, PPF interest. Most of the people things that although the income of this criterion is exempted there is no need to tell Income Tax Departement, but there is nothing hidden from them. Income tax department keeps an eye on the High-value transactions, there is a possibility that you will get the notice from the Income Tax Department. The High Transaction includes Deposit of money, purchase of the high-value house, Investing in FD, Mutual Funds, Equity. All these transactions must be informed by the IT department before they ring the bell of Enquiry. It is very important to aware and follows simple steps to avoid Income Tax notice. Nowadays everything is online it is very easy to follow the instructions and keep yourself away from the IT department. First, Step is to understand the processor of filling the return and be clear about the facts towards the Government of India, If you try to cheat or hide some of the facts, you will definitely stack. There are several segments you can take benefit from it. You must aware of selecting of ITR forms, every form is the path of the declaration to Income-tax Department, For filling of return for Employee, you must select ITR I. Before filling ITR I, make a note of Income from Salary, you can also avail the benefits of exemption for Salaried Employee also fill the income from House and other sources. The Total amount is treated as Gross Total Income. Reconcile your Form 26AS with your TDS deposited into your account, the mismatch in the record, force IT department to send notice. Don’t forget to Declare exempted income even if the amount is nontaxable. Details of Advance tax and Self-assessment tax must be filled properly if you have forgotten to fill the details even though you pay taxes in advance, you will get the Notice. 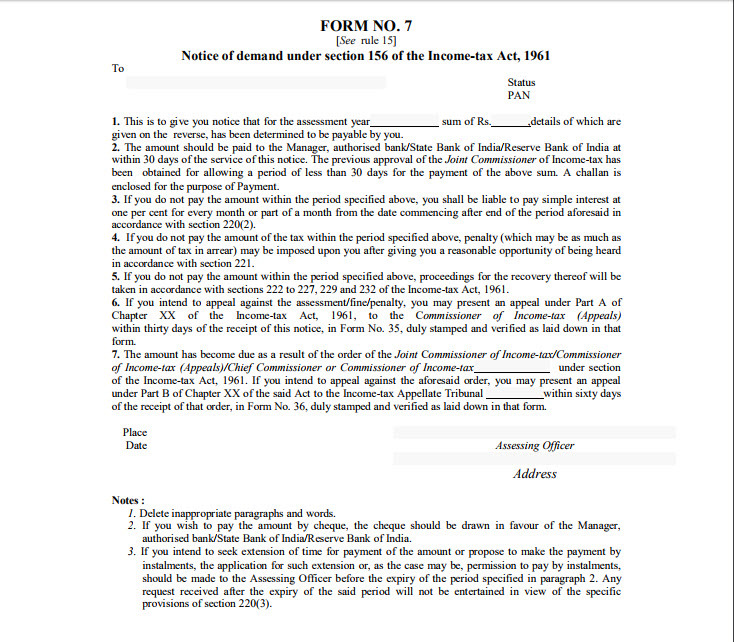 Declaring of all Bank account holding individually or jointly. Bank Account details also help you to take the refund from the Income Tax department. Filling return on time with proper documents and keeping a record of future correspondence, will boost your confidence level, and also improve your Credit rating. Take all benefits under section 80 C, which save taxes.